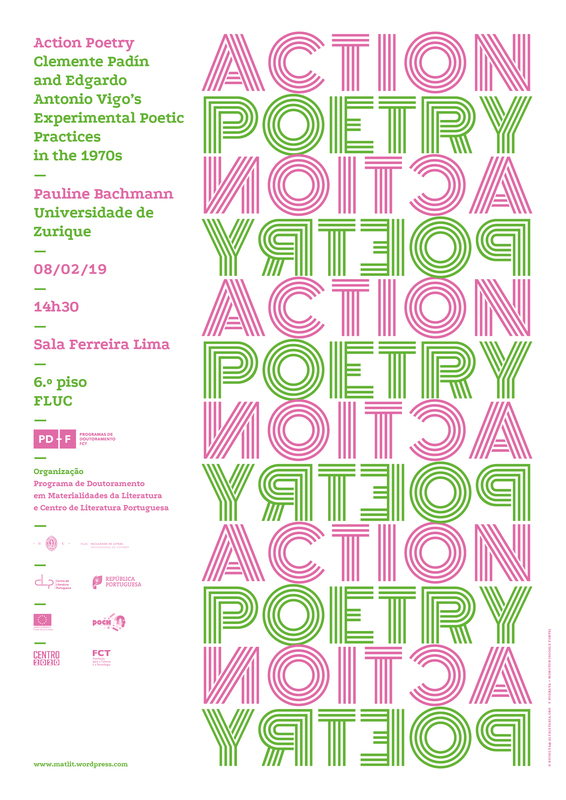 No próximo dia 8 de fevereiro de 2019, pelas 14h30, na Sala Ferreira Lima (FLUC, 6º piso), Pauline Bachmann (Universidade de Zurique) fará a conferência “Action Poetry: Clemente Padín and Edgardo Antonio Vigo’s Experimental Poetic Practices in the 1970s”. Esta iniciativa é organizada pelo Programa de Doutoramento FCT em Materialidades da Literatura e Centro de Literatura Portuguesa (CLP). This presentation explores the transformation of Brazilian concrete poetry into what Uruguayan poet Clemente Padín called “poesía inobjetual”, and Argentinian poet and artist Edgardo Antonio Vigo called “poema para y/o a realizar” under dictatorships and repressive regimes. It draws attention to their subversive and transformative potential in seemingly contradictory situations, and examines the relationship between the phenomenological influence on material reality, the human body, and the semantics of words.